last week, at the face off show at the CCP, we managed to get backstage and take a sneak peek at the three designers' collections. 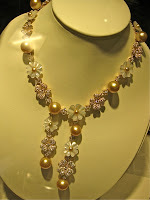 rhett spotted us and showed us the yummy jewelmer pearls laid out in a long table for his models to wear. 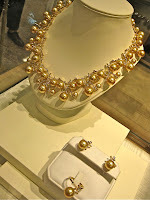 and since we were wearing a rhett eala that night, he said we could choose a neckpiece to complete the look! well, who are we to say no to that?? 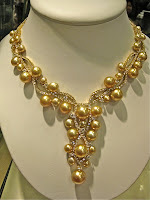 so we chose a long pearl necklace, which we twirled twice around our neck to make it look like a three-strand necklace. feeling hollywood celebrity loaning millions of dollars worth of jewelry for the red carpet! only difference is no paparazzi took our picture that night. then after the show, we had to go back backstage to return the pearls. 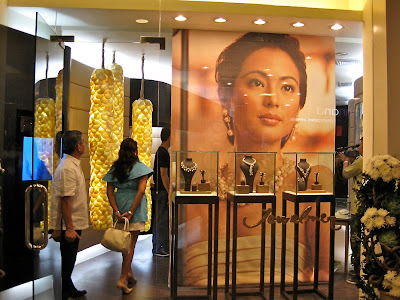 the fantasy was over... we mention this because last monday, jewelmer opened its new store in greenbelt 5 in a space that used to be occupied by lila almario. (sad to see greenbelt 5 stores closing shop one after another... and still so many un-occupied spaces.) 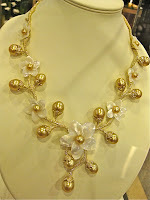 we can ogle and drool over the pearls there any time we want!